Looks very smart, nice clean and minimal interface, cooks quite well too! Is a little prone to finger print marks, and the opening procedure requires a bit of care! 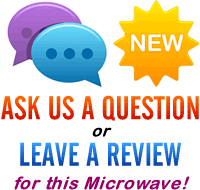 If you're looking to purchase a new solo microwave, then you're not short of options. Russell Hobbs have recently released the RHM2017, which features the fairly standard specification of combining a 20 litre volume with a 800w power output. Built in are five microwave power levels, several time saving auto cook menus, a defrost mode and a built in LED digital clock and timing system. Out of the box, the first thing you notice about the RHM2017, other than the shiny mirrored door, is that it features a dial and button based system, rather than solely using buttons like many of it's competitors. Top marks to Russell Hobbs for providing clear text labels next to each input option - our pet hate is having to guess which button operates which function. The featured controls are fairly minimal, which a thin vertical lines of subtle buttons hovering above the main dial used to control the time and weight input. Opening the door requires a pull on the door, with no button used to release the catch. Unfortunately this can move the microwave a little, and if you have been microwaving a full jug of liquid, it may be a touch difficult to open the oven without spillage. This isn't a major issue - we soon got the hang of the opening system - initially however it may cause some problems as you get used to the amount of force required. Keeping the mirrored door fingerprint free and clean is nigh on impossible - however instead of wiping with a duster or damp cloth, try applying a tiny amount of vinegar or window cleaning solution and you should be able to remedy this. As the specification suggests, the overall size and capacity are both fairly small - being 26cm by 45cm by 39cm externally, and featuring a 24.5cm sized turntable. It's worth checking that your larger dishes will fit prior to buying - all of our standard test containers fitted comfortably. 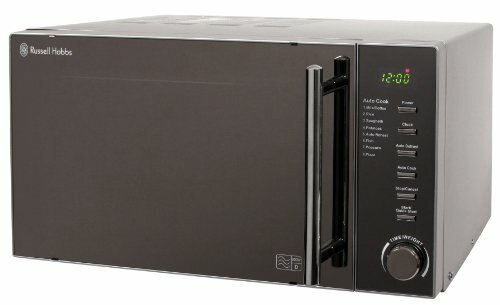 In terms of performance, the RHM2017 works as well as any small sized solo microwave in this price bracket. 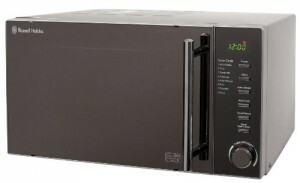 It heats up food pretty quickly, and as mentioned earlier, the controls are intuitive to operate. the auto cook menus appear to be accurate, and help to save time when calculating cooking times for regular dishes. For those who are interested, the options are Milk/Coffee, Rice, Spaghetti, Potatoes, Auto Reheat, Fish, Popcorn and finally Pizza! After a couple of weeks each of testing the RHM2017, our team were largely impressed by this microwave. It's simple to use, provides a fairly decent performance and also easy to clean. For the money, the Russell Hobbs RHM2017 offers decent value, and also looks the part. It may require a quick polish to remove any finger prints, but asides from that it's a solid solo microwave oven for those on a budget. I brought this microwave once before and I wanted the same so yesterday I got the same microwave back home and it had a few differences even though there the same, the writing on the front is much bigger and a plastic silver handle rather than a sturdy chrome one and face front. The picture compares rather a bit to what I have received even though they are the same make and model? !